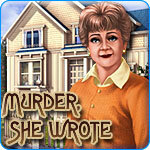 Murder, She Wrote Game Review - Download and Play Free Version! Solve Deep Mysteries With the Cast of the TV Show "Murder, She Wrote" and Feel Like a Real Investigator! Objects list initially missing vowels that must be found in the form of typewriter keys spread out at each location. Items change placement each time a location is revisited, offering a new challenge each time the game is played. Hints continuously available once the ribbon spool for the typewriter is found within each location. Voice acting scenes discussing the mystery can easily become annoying but can be skipped. Items usually vibrant and simple to find, a detriment to players who seek a challenge. Take Part in the Hit Mystery TV Show! Murder and Jessica Fletcher are never far apart! Join her and other members of the cast of the TV show "Murder, She Wrote" to investigate five exciting cases. Investigate boats, gardens, laboratories and much more in these in-depth adventures. Feel like you're a part of the TV show! 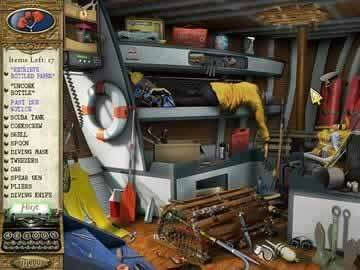 This hidden object game will keep you on the edge of your seat as you search for hidden clues because most objects are important to solving the mystery. Before you start finding objects, you'll have to find the keys missing from Jessica's typewriter to read all the clues. Enjoy a variety of interesting scenes and while some scenes repeat, the objects to find are in different places. Hints recharge over time or you can find Jessica's typewriter ribbon once per level to instantly recharge a hint. Solve various interesting puzzles like a real murder investigator! Puzzle out which buoy belongs to which boat using a list of clues, play a memory mini game to match pairs of cigar boxes to find which the culprit prefers, assemble pieces of shattered objects and much more. This game is great for everyone because TV show fans will love how true the game stayed to the show and gamers unfamiliar with the show will enjoy the deep mysteries and interesting characters. This game is also great for everyone because you can play with a timer or without and the objects to find are colorful and easy to see so you won't feel frustrated. Feel like you're really in a mystery TV show now with Murder, She Wrote! Murder, She Wrote is an adaption of the television classic starring Angela Lansbury that takes strides to mimic the show. Lansbury's character, Jessica Fletcher, is a murder/mystery novelist who stumbles upon crime in her daily life and experiences success as an amateur criminologist. 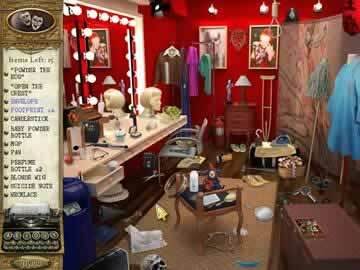 This game features five murders that must be solved by locating hidden objects within a crime scene to discover the culprit. The typewriter hint feature and familiar characters offer a good tie in with the show. One interesting feature of the game is the object list is initially missing vowels that are hidden in each location in the form of typewriter keys that must be found to complete the list. The keys are generally simple to locate however, which detracts from this unique game aspect. Items themselves are usually very vibrant and easy to spot, which can be a detriment to the player who seeks a challenge. Video of dialogue between characters is time consuming and can easily become boring but can be skipped.